The great works of God were in the past tense for these two disciples. They were now in retreat. They had misunderstood who Jesus was, had sold him short. They described to this stranger a different kind of conflict because they had expected a different kind of rescue. Their savior was someone who could be “handled” by the authorities, someone who could not control events as they happened to him, a victim. What a crushing feeling of disappointment must have been written across their faces. If only they had really heard what Jesus had been trying to communicate all along. Why would anyone come to me for help if I look unsteady? It is increasingly difficult for the visible man to hear and understand eternal truth. Did you pick up any “attitude” in Cleopas reply? “What kind of dumb hick are you? Let me explain what’s been going on.” They are walking in the wrong direction yet are able to maintain a clear air of superiority. I wonder what that feels like, I’m glad I never act like that (ha!). This part of the story is that constant and classic reminder to us all that we often misunderstand God’s will and then go about constructing and living in a different reality (Gordon-Conwell Seminary estimates that there are 43,000 Christian denominations world-wide, all reading the same Bible). That’s why Jesus taught his disciples to pray for God’s will on earth as it is in heaven. 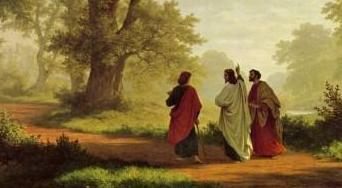 That’s why he came and joined these two on the crooked road to Emmaus, to straighten things out.